GMB, a trade union, launches 'Thinking Differently at Work' campaign to reduce discrimination. Given that 70% of neurodivergent workers report experiencing discrimination at work, trade union GMB hopes to change this by launching a new "toolkit". The GMB "toolkit" defines neurodiversity as "the idea that cognitive conditions, such as autism, ADHD, dyslexia and dyspraxia, are natural variations in the way people think and process information". In the context of employment, it states that the term "recognises both the difficulties that people who have these conditions may encounter and also the unique strengths that can derive from thinking differently". “Whilst we might be in the in the dark when it comes to knowing the true financial impact of discrimination against neurodivergent workers, we do know the massive detrimental impact on neurodivergent workers’ lives. We need better training, policies and support for managers to ensure their neurodivergent employees don’t lose out - from loss of dignity and confidence, progression opportunities and for some neurodivergent people like me, even losing out on job opportunities. Neurodivergent workers are not looking for pity, ‘special treatment’ or a one size fits all approach to reasonable adjustments. We want the right to achieve our full potential, to develop careers and to access training, and have the opportunity to succeed and be valued at work". 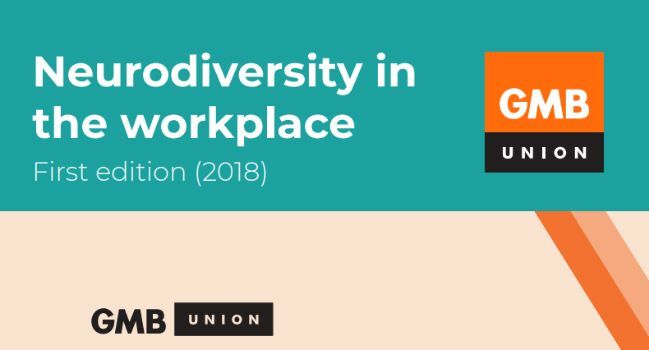 The GMB neurodiversity toolkit includes advice for employers on the vast scope of adjustments that may help to accommodate workers: from interviews to office spaces. As well as practical recommendations, legislation concerning discrimination and equality is included. GMB rep Sherine Thompson says that "since joining GMB, I have my confidence and inner joy back. I now see my dyslexia as a gift that enables me to think out of the box and utilise my creative side." Click here to download the GMB toolkit. ** DWP response to GMB Freedom of Information Act request 04 October 2018.